his story that was printed in The Indianapolis Star on April 21st 2008 in the LIFE section. Story By Indianapolis Star reporter Barb Berggoetz. 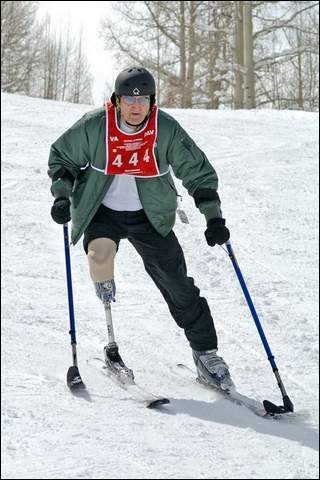 month during the National Disabled Veterans Winter Sports Clinic in Snowmass Village near Aspen, Colo. It was a week of triumphs and camaraderie. Like Caywood, many are missing limbs. Some are blind. Some are paralyzed. Others suffered traumatic brain injuries. They came from all military branches and served in World War II to Iraq and Afghanistan. Among five Indiana veterans who went were two from Indianapolis: Portray Woods, 36, who lost an arm and suffered a brain injury in Iraq, and Chad Wuertz, 35, who was paralyzed after breaking his neck in an accident at Fort Riley in Kansas. "To me, it's just a life-altering experience in a positive way," said Caywood, who has gone on the trip three times. "It renews your enthusiasm for life. The shared experience of (military) service and the Winter Sports Clinic transcends all ages and disabilities." The clinic, co-sponsored by the U.S. Department of Veterans Affairs (VA) and Disabled American Veterans service organization, is the world's largest annual rehab event of its kind, said clinic staff. It promotes rehabilitation by teaching downhill and cross-country skiing and offering activities such as rock climbing, fly-fishing, scuba diving, snowmobiling and snowboarding, using adaptive equipment. Caywood, who volunteers as commander of the Greenwood DVA group, said he had never skied before his first trip in 2005, and had never gone fly-fishing before this trip. This year, though, he got a little more serious about his skiing. The VA paid for the prosthetic ski leg, made by the Rehabilitation Institute of Indianapolis, that fits right into his ski binding. Adorned with Indianapolis Colts insignia, the leg is lightweight and easy to maneuver. The special Outrigger poles have small ski-like bottoms, instead of pointed ends. He's used the equipment at Indiana's Paoli Peaks, too. Some blind veterans used tether lines, along with instructors, to guide them down the mountains. Others sat on seats or used mono skis. "They have adaptive equipment for every type of disability," said Caywood, who retired as a DAV national service officer in Indianapolis in 2000. Now, he's a self-described "house husband" who looks after his daughter, Whitney, 17, and son, Will, 12. And wife Cindi says he cooks dinner nightly. But the Winter Sports Clinic is a special time for him and the other vets. They attempt physical feats they otherwise couldn't or wouldn't do. Maybe more important, they share war memories and life experiences with others who are similarly challenged. "You just feel a real bond with the other guys," said Caywood. "All of us here have service-related injuries. We develop pretty close friendships in that short period of time. In some ways, we're all different, but in other ways, we're all the same." Caywood and the two Indianapolis Army veterans who went to the clinic served at different times and suffered different injuries that have altered their lives in different ways. But each one has maintained a strong link to other veterans. Caywood, who grew up in New Albany, was drafted into the Army and served in the infantry. After his injury, he says he was "definitely bitter" at first and still has his bad days physically. But he says he was fortunate to have worked for the DAV in Indianapolis for 15 years, helping other veterans with their benefit claims. And he remains active in the local and state DAV activities. While his disability still affects his day-to-day life, he doesn't look back. "It's something you accept from the time it happens," said Caywood. "I try to look not at what's gone, but at what's left." Call Star reporter Barb Berggoetz at (317) 444-6294.